Arcisstr. 21, Institutsbau 5. OG. 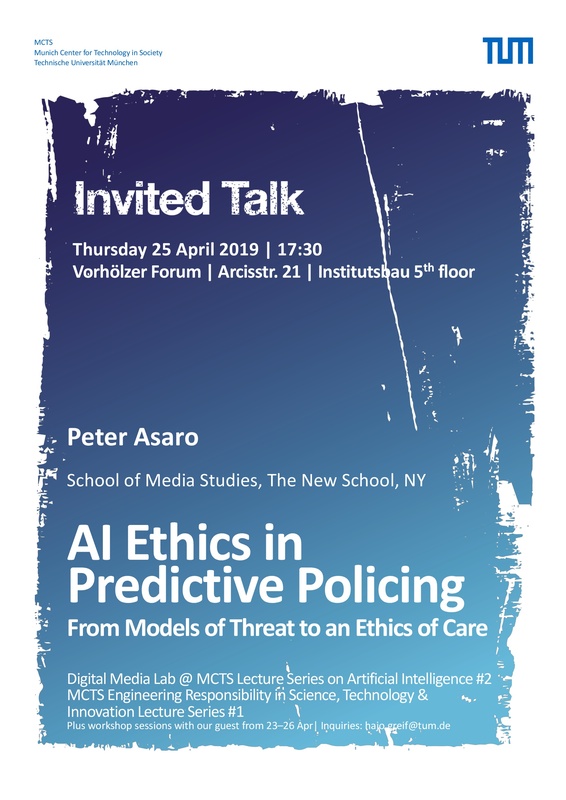 Peter Asaro, School of Media Studies, The New School, New York, will present a public lecture on “AI Ethics in Predictive Policing: From Models of Threat to an Ethics of Care”. Significant concerns have been raised around the use of data-driven algorithms in policing, law enforcement and judicial proceedings. This includes predictive policing–the use of historic crime data to identify individuals or geographic areas with elevated risks for future crimes, in order to target them for increased policing. Predictive policing has been controversial for multiple reasons, including questions of prejudice and precrime and effectively treating people as guilty of (future) crimes for acts they have not yet committed and may never commit. This central controversy over prejudice and precrime is amplified and exacerbated by concerns over the implicit biases contained in historic data sets, and the obvious implications for racial, gendered, ethnic, religious, class, age, disability, and other forms of discriminatory policing, as well as how it shapes the psychology and behavior of police officers. This paper outlines a new ethical approach that balances the promising benefits of AI with the realities of how information technologies and AI algorithms are actually adopted, applied and used. It proposes that AI ethics should be driven by a substantive and systemic Ethics of Care, rather than a narrow Models of Threat based on utilitarian risk and threat models. While it focuses on law enforcement policies and policing practices, it hopes to contribute to the broader discussion over the ethical application of AI technologies in government policy-making and the delivery of public and commercial services more generally. The paper concludes that while data-driven AI techniques could have many socially beneficial applications, actually realizing those benefits requires careful consideration of how systems are embedded in, and shape, existing practices. Absent such consideration, most applications are likely to have unjust, prejudicial and discriminatory consequences. This conclusion supports a proposed Ethics of Care in the application of AI, which demands moral attention to those who may be negatively impacted by the use of technology. This lecture is part of the interdisciplinary lecture series on contemporary issues in Artificial Intelligence hosted by the Digital Media Lab. This event will be co-hosted by the Engineering Responsibility Lab at MCTS, and opens its own public lecture series.